“He is a very outstanding man… I’m totally supportive,” the US President said of Brett Kavanaugh. PRESIDENT DONALD TRUMP rejected Democratic calls for the FBI to investigate a sexual assault allegation against his Supreme Court pick Brett Kavanaugh, as both sides mobilised for an explosive showdown in Congress over the nomination. The conservative judge appeared set to sail through Senate confirmation for the vacancy on the nation’s top court until a California professor publicly accused him of assaulting her when they were teenagers, almost four decades ago. Two days after Christine Blasey Ford went public with the charge, Trump restated that he favors allowing both Kavanaugh and his accuser to be heard out – but said there was no need for a federal probe of the incident. “I don’t think the FBI should be involved because they don’t want to be involved,” Trump told reporters at the White House. “We are looking to get this done as quickly as possible,” Trump said, while reiterating his support for his nominee. He is a very outstanding man… I’m totally supportive. Ford came forward with the bombshell allegation on Sunday, just days before the Republican-controlled Senate Judiciary Committee was expected to approve Kavanaugh as the ninth justice of the Supreme Court. Kavanaugh strongly denies Ford’s account, according to which he trapped her in a room at a high school party, when he was 17 and she 15, pinning her down and covering her mouth while trying to undress her. Their dueling testimony had been expected to take place Monday, in a piece of blockbuster Washington theater putting both Trump’s bid to tilt the Supreme Court to the right and political momentum ahead of November midterm congressional elections into play. Committee chair Chuck Grassley declared a one-day hearing to include just Kavanaugh and Ford, to be followed by a vote two days later. 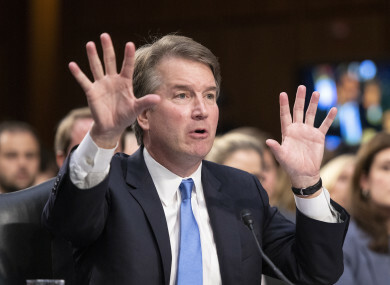 But Ford’s testimony remained uncertain today, and Democrats demanded other witnesses – including possibly another man Ford says was involved in the assault – be called to testify as well. Pressure was building meanwhile from supporters of the year-old #MeToo movement exposing sexual harassment to respect Ford’s claim. “Anybody who comes forward at this point to be prepared to testify in the US Senate against someone who’s being nominated to one of the most powerful positions in the US government, that takes an extraordinary amount of courage,” said Democrat Kamala Harris, a member of the Senate panel weighing Kavanaugh’s nomination. The American public deserves to know the character of someone who will serve for his entire life on the highest court in our country. The charge against Kavanaugh has left Trump and his Republicans in the precarious position of having to reject Ford’s accusation without alienating women voters ahead of midterm polls that threaten their control of Congress. Both sides were gearing up today for an epic battle that recalled the 1991 fight over Republican-nominated Justice Clarence Thomas, who was accused of repeated sexual harassment by a staffer, Anita Hill. Republicans at the time brutally and groundlessly cast aspersions about Hill’s own character. But Ford and Democrats now have the support of the potent #MeToo movement, which over the past year has churned up example after example of powerful men in politics, media and entertainment who got away for years with sexual harassment and assault against women. That could explain why Trump, never one to shy from acid attacks on anyone threatening his agenda, has declined to comment directly on Ford’s accusation, even as he expresses confidence in Kavanaugh. Instead Republicans were preparing to cast the hearing as an unresolvable “he said-she said” dispute rooted in a hazy incident involving teenagers from 1982. They have mustered letters from women declaring Kavanaugh a judge, classmate and colleague with a sterling record. “For the entire time we have known Brett Kavanaugh, he has behaved honorably and treated women with respect,” read a letter signed by 65 women who said they knew him around the time of the incident – even though he went to an exclusive all-boys school. An activist group focused on promoting a conservative judiciary began buying $1.5 million media ads to defend Kavanaugh. Meanwhile the exclusive all-girl Holton-Arms School which Ford attended came to her defense. “As a school that empowers women to use their voices, we are proud of this alumna for using hers,” wrote the school’s head Susanna Jones. Scores of Holton-Arms alumni signed a separate letter in her support, calling for a “thorough and independent” investigation. Email “Trump rejects calls for FBI probe into his Supreme Court pick over alleged sexual assault”. Feedback on “Trump rejects calls for FBI probe into his Supreme Court pick over alleged sexual assault”.